East Point Pick up from Darwin, we went out to East Point. 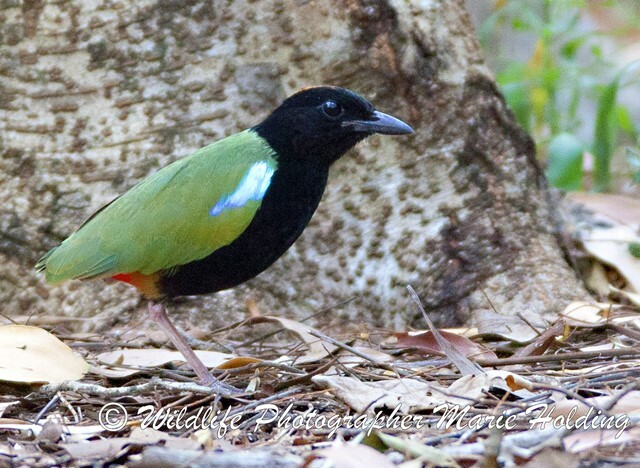 Almost the first bird to be seen on the forest walk was the Rainbow Pitta! Another notable sighting, or 'hearing' was a Lemon-bellied Flyrobin imitating the calls of Spangled Drongo (clear but comparatively feeble), White-breasted Woodswallow and others. Another surprise was a Northern Brown Bandicoot which I actually stepped on when I put one foot off the path to look at fruit on a tree, it scurried off and stopped ten metres away and Marie got a photo. 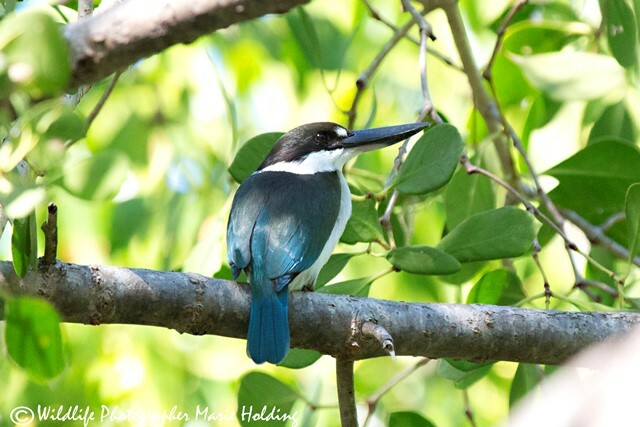 At the end of the Mangrove Boardwalk Collared Kingfishers eventually came in and posed nicely and Blue-faced Honeyeaters came around while we had morning tea at Lake Alexander. Sightings were Spangled Drongo, Magpie-lark, Black Kite, Lemon-bellied Flyrobin mimicking Spangled Drongo, White-breasted Wood-swallow and others, Shining Flycatcher, Rainbow Pitta, Northern Fantail. Rapid Creek Fogg Dam We checked in and had dinner at Corroboree Park. Highlights for the day were the shere numbers and variety of birds. While having a bush breakfast at Corroboree we were amused to see a Whistling Kite take a swipe at a Sulphur-crested Cockatoo as he flew by. We did a slow drive along the Marrakai track, watching and listening for birds. We stopped many times and John and Maree took a lot of photos. The highlight was a very cooperative Buff-sided Robin at Margaret River. 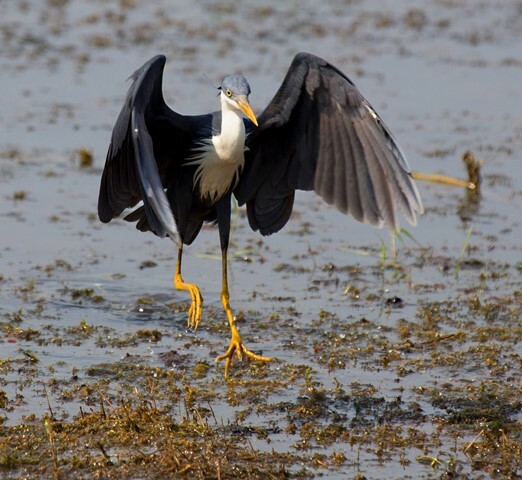 After a picnic lunch at a billabong nearby, we continued on to Bird Billabong and then dinner and check in at Mary River Wilderness Resort. Mary River - Cooinda We started out early with the use of the Bird Watching Buggy and did the Bamboo Walk. What a fantastic way to cover ground with heavy camera gear! We had some great views of a white morph Grey Goshawk, with beautiful, soft early morning light for some very nice photography. Kakadu - Mamukala Wetlands Here we had a picnic lunch and then went down to the hide, with some nice views of bush birds on the path along the way. A Comb-crested Jacana was gently tending his eggs quite close to the hide. 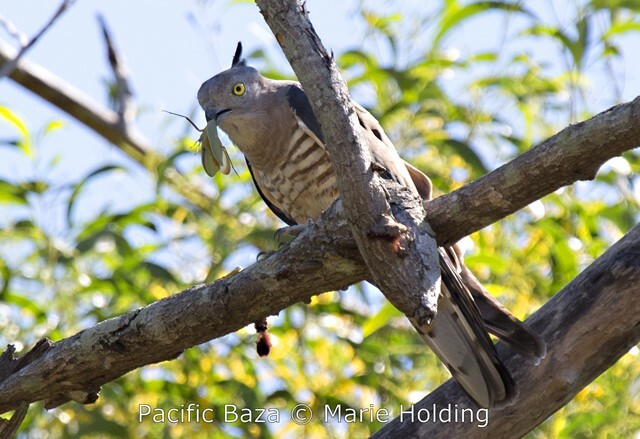 Ubirr A Pacific Baza flew up to a tree in front of us and we stopped and Maree got some amazing shots as he caught a large insect and ate it. After that we went up to the art site and saw ancient rock art in the escarpment. 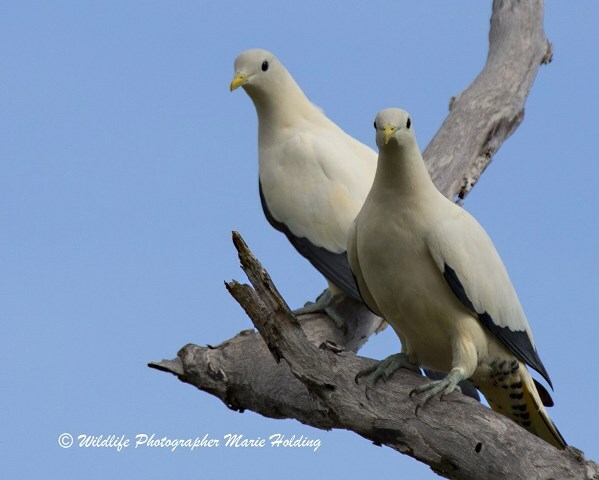 Three mature White-bellied Sea-eagles were interacting/fighting overhead on the Nadab Lookout On the Mangarre walk we had glimpse of a Rainbow Pitta and then went up to the the Bardedjilidji sandstone walk. Here we had good views of Chestnut-quilled Rock-Pigeons. Next we headed off for Cooinda to check in and have dinner. Burrunggui and Yellow Waters. We start the morning off with breakfast at dawn at the start of the Gubara walk, near Burrunggui. Early morning lighting on the escarpment made for some lovely views. We had a glimpse of a Banded Fruit-Dove on the way back to the main road. 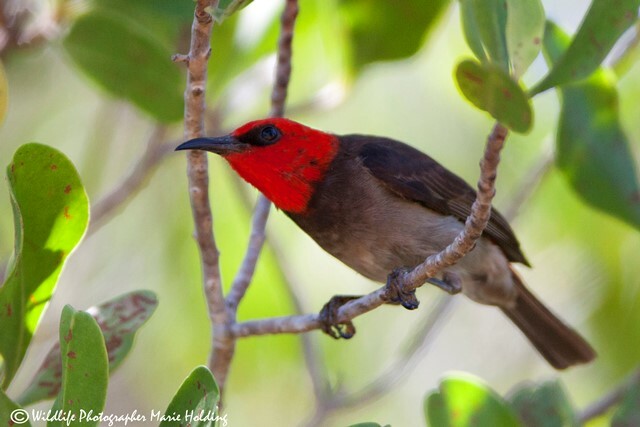 At Burrunggui the only endemic birds we saw were two White-lined Honeyeaters as they called and flew over us near the 'Barrk Gallery'. 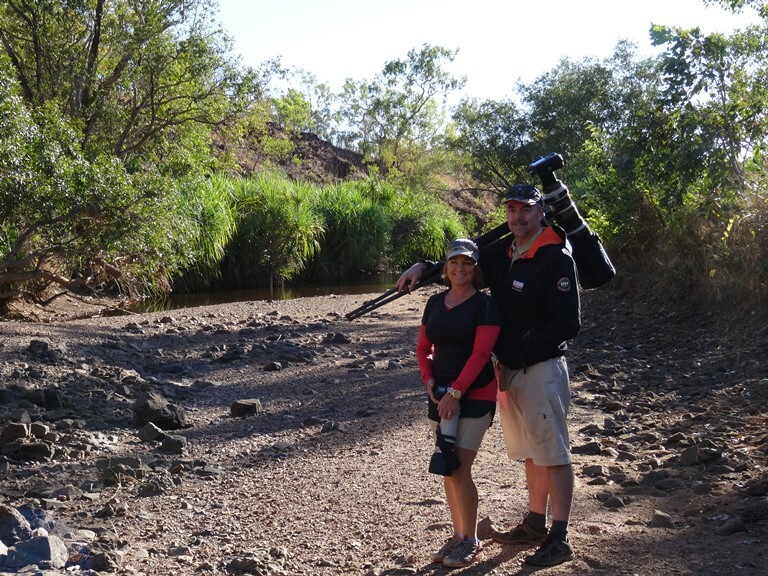 While fairly quiet for birds, the walk was memorable for the amazing rock art and scenery. 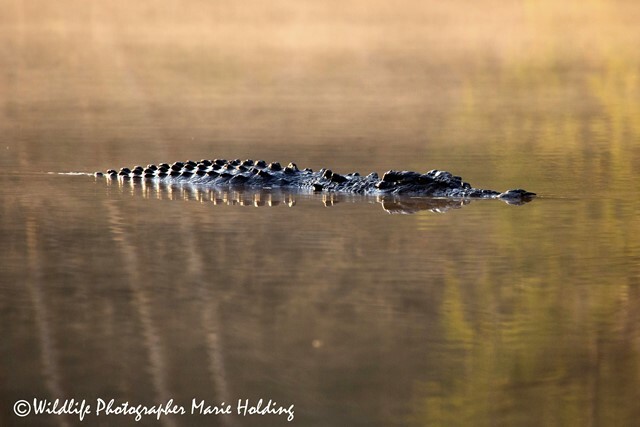 We joined the 4.30pm Yellow Water cruise and saw a lot of birds, some crocs and a magnificent sunset. This cruise is getting better and better as the dry season progresses. Cooinda - Katherine John and Marie took the dawn Yellow Waters cruise and were rewarded with even more sightings and great lighting for their photography. We left Cooinda and headed south for Katherine. 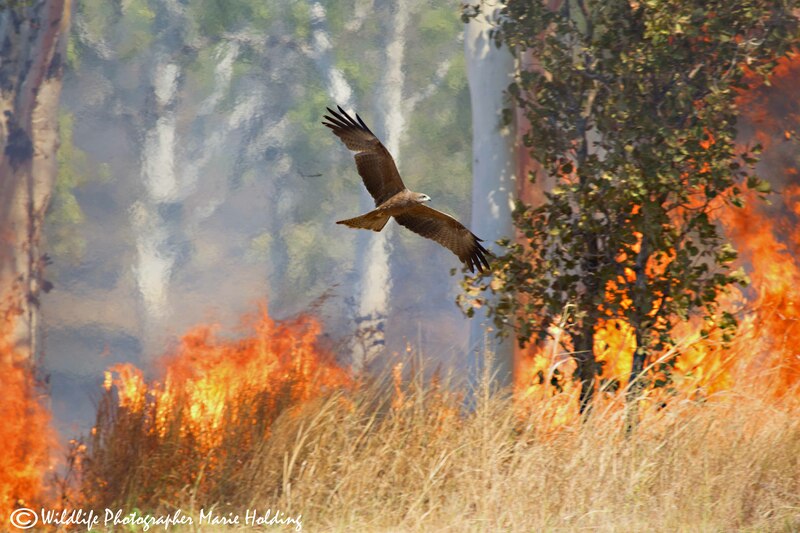 We stopped to photograph a pair of Black-breasted Buzzards and later 'firehawks', Black Kites in big numbers swooping through the smoke and flames of a controlled burn. None were seen picking up burning sticks to start new fires.... Another interesting sighting was a Common Tree Snake seen crossing the road south of the Maguk turn off. We had lunch at Copperfield Dam, with Pied Butcherbirds serenading and Red-tailed Black Cockatoos flying over. At the 5 km spot on Edith Falls Road we boiled the billy for coffee and settled in to see if any Gouldian Finches would come to drink. A small group did come in along with one Cockatiel and some Hooded Parrots. From there we headed off to Katherine where we checked in and had dinner. Katherine - Pine Creek At dawn we were back at the Edith Falls road spot for a bush breakfast and to try to get photos of Gouldians coming in to drink. Some did, but not where we expected them to. Marie got some great photos to the back of where John and I were set up. 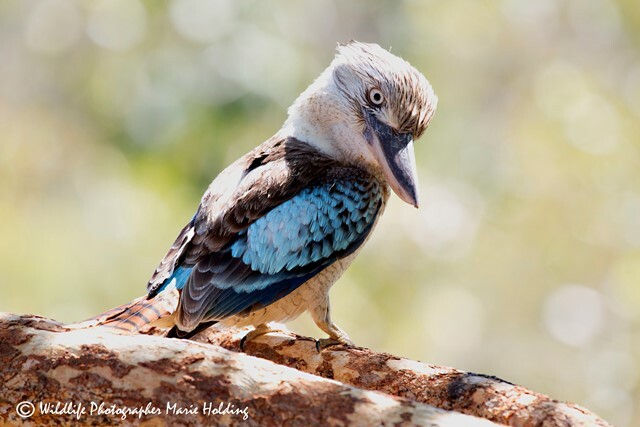 We headed back to Katherine to see the Nitmiluk Gorge, had lunch at the visitor centre with Great Bowerbirds, Blue-winged Kookaburras and Blue-faced Honeyeaters. Then we headed up to Pine Creek to check in and have dinner. Pine Creek - Darwin We left Pine Creek at dawn to have breakfast at a nearby birding spot. 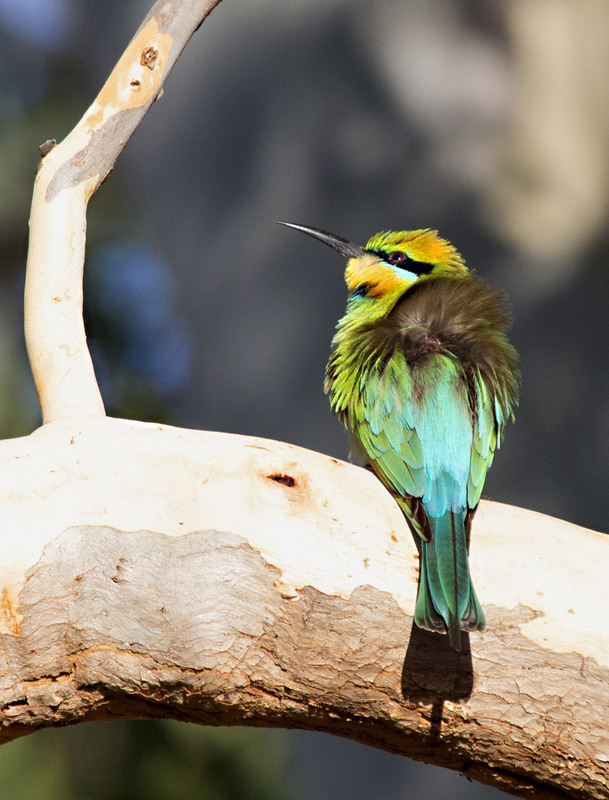 Gouldian Finches, Double-barred Finches, Hooded Parrots, Northern Rosellas and other birds came in. Next we stopped at a small waterhole where we saw Brolga, Black-necked Stork, Brown Quail and a lone red headed male Gouldian sharing a dead tree branch with a Great Egret. 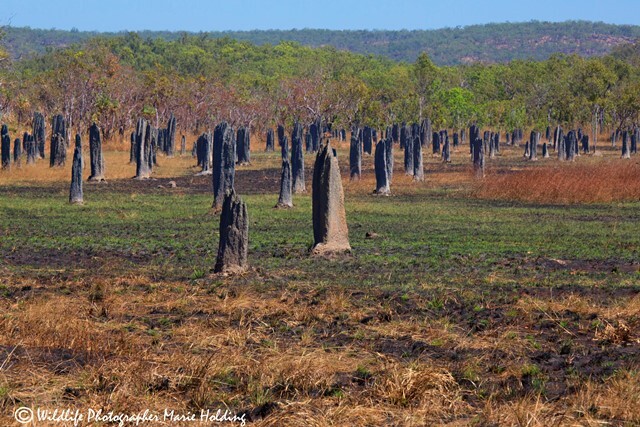 From there we headed down to Litchfield National Park, with a brief stop to view the magnetic termite mounds and then Wangi Falls. From there it was on to Darwin via Berry Springs.